totally awesome!!! that last bag looks amazing! Wow! Is that a hint? Yes. That is to inspire you. Get to work, Sewer. I love to see new patterns and tutorials. Thanks for sharing! I love the boxy pouch. They would make such cute make-up bags (assuming they were properly lined)! I'm currently on a pouch kick and these are awesome, especially the first two! Way to go! Lovely selection, so pretty. Last bag is fab. I'm friends with Amy from During Quiet Time. How awesome to see her spotlighted--she is very creative! Thank you for featuring my iphone pouch. If any one is interested in making it, I designed it for the last version of the iphone and I hear that the new ones are a little bit bigger so you may need to adjust the pattern slightly if you have brand new model! I think I need one of each! Thanks for compiling this group. Great round up of tutorials! I love all of them. Thanks for sharing! Thank you so much for this post. I want to let you know that I posted a link to your blog in CBH Digital Scrapbooking Freebies, under the Page 2 post on Jul. 29, 2011. Thanks again. great links- Thanks for sharing. Now I know what I'll be doing this weekend- Denim bag! Awesome! Thanks for sharing these links! thanks for sharing my lil tote. :) I've totally abused it all summer and I love it. 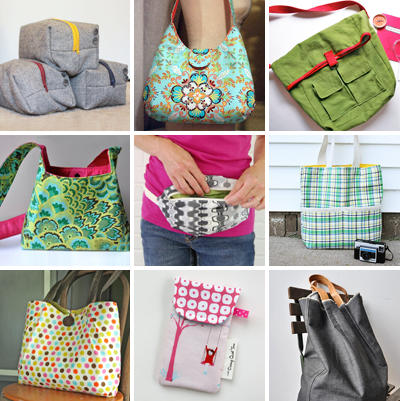 Thanks so much for adding my hip pouch to your round-up - and for introducing me to some cool bag tutes!! Thanks for all your nice inspirations! Love your blog. Thanks for the great post! What would you recommend for someone just getting back into sewing? I made 3 of the Nature Explorer bags- Chez Beeper Bebe's (Holly's) instructions and tutorial are awesome, so easy to follow. My kids LOVE their bags. We used them for the beach- now I'm going to make one for ME! Practical and beautiful!!! I loved it! Wow .... if you need be I'll be over in the corner between he stack of fabric and the sewing machine1! TYVM! !